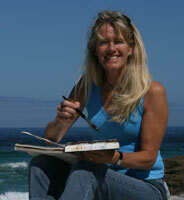 Hazel Soan is the hugely popular Watercolour Challenge TV artist. 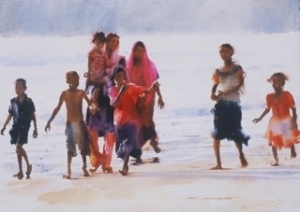 She has published several instructional books including Watercolour Landscape Techniques and African Watercolours. Her latest book is Watercolour Rainbow in which she discusses the properties of pigments. 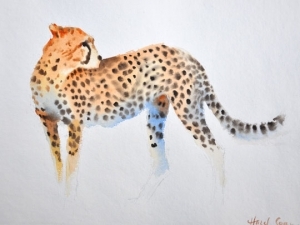 Her love of Africa and her passion for wildlife is the subject of many of her paintings. Hazel is a full time professional artist. She paints everyday, no matter where she is. She is a progressive artist with an evolving style, which is reflected in her varied portfolio and is an inspiration to all painters. Her time is divided between Africa, where she lives for half of the year and London where she has her own studio. Hazel’s love and enthusiasm for life and people is infectious. Combined with her natural ability for teaching art and her caring nature, she is an excellent painting host. Hazel has been hosting painting holidays for Spencer Scott Travel for over 10 years and has taken students to Italy, France, Greece, Sri Lanka, Kenya, Zambia, Tanzania and India. We love working with Hazel. Her more structured approach is particularly suited to confident beginners and intermediate students. Watercolour is her preferred medium when travelling.